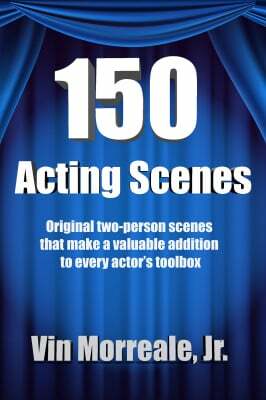 BURNING UP THE STAGE acting workshops, by featuring hundreds of original pieces you can use for auditions, showcases, or to expand your character range. They're also a lot of fun just to read! Our Next Burning Up The Stage Acting Workshops! Getting typecast is every actor's challenge or advantage. The more diverse characters you can create, the more you will impress Castinng Directors. This FIVE HOUR WORKSHOP will help actors broaden their Character range by performing multiple Monologues and Acting Scenes under the direction of Vin Morreale. Open to both new and experienced actors, 14 and up. or you can save 20% for a total cost of only $40 by using the PayPal link below. 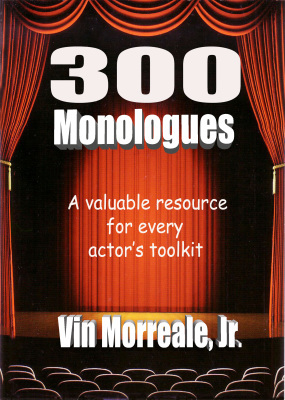 And if you buy a copy of either of Vin's books, 300 MONOLOGUES or 150 ACTING SCENES, you will receive an additional $5 OFF EVERY ACTING WORKSHOP THROUGH DECEMBER 2019! Buy it here and bring to the class to receive the discount. As Greater Kentucky’s largest independent Casting Service, Vin Morreale has cast more than 30,000 actors in commercials, films, stage plays, TV shows, print ads and radio spots, including 33 feature films and TV episodes in the past few years alone. Thousands of beginning and professional actors have studied with Vin over the past two decades, and actors travel from a five state radius to attend these workshops. Find out what all the excitement is about and reserve your space today. Email [email protected] for more information. Please put either HEYMAN TALENT WORKSHOP or CREATIVE MOTION WORKSHOP in the subject line of your email, and include your full name, phone number, best email address and age to reserve your space in class. Academy Arts offers a variety of 5 hour workshops as listed below. Everyone who attends will take part in atleast 3 short scenes with different acting partners. It will be lots of fun for new and professional actors alike. Classes will cover auditioning techniques, improvisation, proper video submissions, and answers to questions about the difference in auditioning styles for regional and major markets. 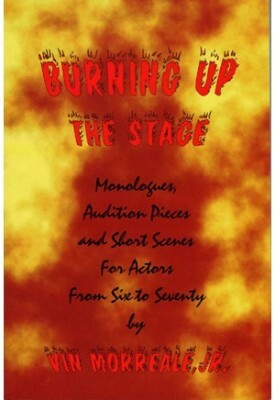 Burning up The Stage Workshops are open to new and experienced actors, age 14 and up. Academy Arts can offer seperate childrens workshops as well. Monologues are among the most important tools for building a character from the inside out. Some of the most memorable scenes use a short monologue to reveal far more about a characters feelings, relationships, and motovation. Learning to MASTER THE MONOLOGUE can take your acting to the next level. In film and video there is only one audience member that really matters. The camera has to feel what you feel, understand what you hunger for, and capture the pain or joy in every glance. That complexity is what Captivating the Camera is all about, Giving a performance that is so complete and so compelling, the camera cant look away. A great performance is not just how well you deliver your lines, its about creating a special relationshiop with other characters, as well as your audience. Pulling them into the intensity of the scene, and making them feel for your character. This workshop will teach you to Build Screen Chemistry and Deper Characterization. The top actors know that every time you take the stage or appear on camera is an opprotunity to Steal the Scene- giving a performance that is so complete and so compelling, your audience cant look away. This is especially important during an audition, when you only have a few minutes to capture the directors attention.